The Mercure brand is launching its BOT, an up-to-the-minute instant messaging solution available on Facebook and Messenger. Offering a hotel experience anchored in a specific locality is the very essence of the Mercure brand and its venues. Everything from design to food is geared towards helping guests grasp what makes a city tick and providing inroads into the history and hidden treasures that form the identity of a place. But only a BOT is capable of memorizing the full range of stories from so many places around the world! This handy tool will enable travelers and neighborhood residents alike to discover the “Local Stories” that surround them, simply by geolocating and allowing themselves to be guided. This one-of-a-kind conversational BOT promises to provide users with a fresh look at each city by sharing the secrets known only to locals. All users need to do is geolocate and ask the BOT what’s worth a look nearby, and then let themselves be guided through the conversation. The BOT is also aimed at local communities wishing to rediscover their city or neighborhood. Users themselves will enrich the experience and ideas contained in the Local Stories over time. Inspired by the finds prompted by this veritable travel companion, they will in turn be able to share their own recommendations, thereby enriching the experience for other users. 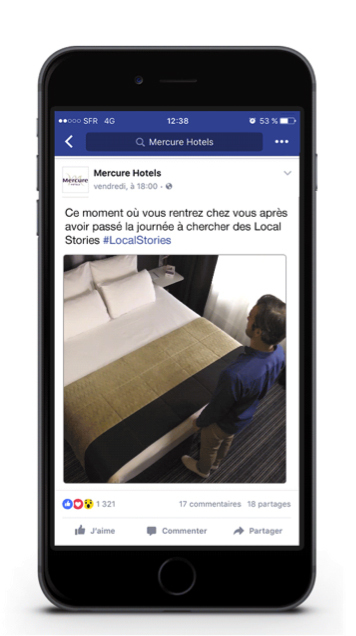 This one-of-a-kind conversational BOT enables Mercure to showcase the specific local flavor of each city and strengthen its image as a brand rooted in its local environment. 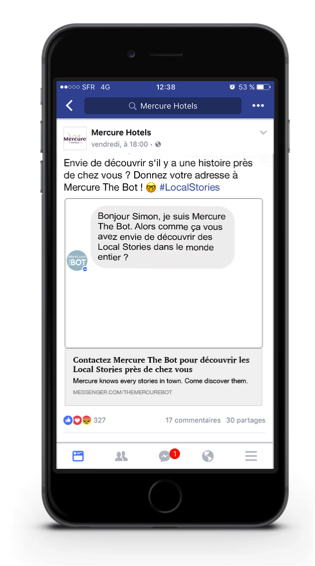 Designed by BETC, the Mercure BOT is available from the dedicated Facebook page Mercure the Bot, on Messenger and will be soon relayed through Mercure Facebook page. With Mercure, AccorHotels offers hotels that are all different and locally inspired. Mercure is the only midscale hotel brand that combines the strength of an international network with a strong quality commitment and the warm experience of hotels that are rooted in their local community. Mercure hotels are managed by enthusiastic hoteliers and welcome business and leisure travelers across the world. Mercure has over 730 hotels in 55 countries. They are ideally located in city centers, by the sea or in the mountains.